A Mississippi State researcher with interests in hydrology, ecology, watershed management, climate change, and computational modeling and simulation is being named the assistant director of the university's Northern Gulf Institute and Geosystems Research Institute. Anna Linhoss new role will include collaboration with a multitude of research teams. NGI and GRI both operate under the umbrella of MSU's Office of Research and Economic Development. "We are confident that through her leadership Dr. Linhoss will contribute innovative ideas and design research programs that address increasingly complex environmental science challenges," said David Shaw, MSU vice president for research and economic development. Linhoss work has been recognized by the National Academies of Sciences, Engineering and Medicine; National Fish and Wildlife Federation; and National Oceanic and Atmospheric Administration, among others. She has received 18 competitive research grants totaling $4 million. Robert Moorhead, NGI and GRI director said Linhoss brings a wide range of experiences and insight into her new position with her successful work in hydrologic and ecological modeling. 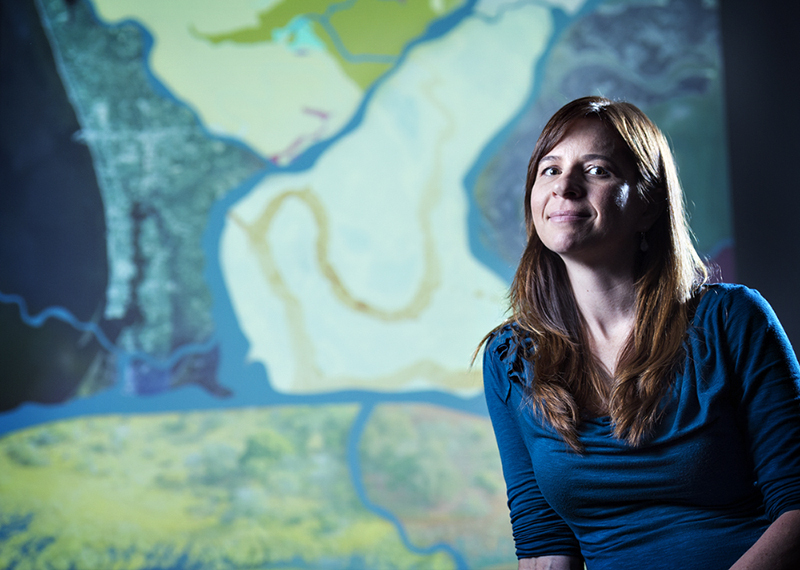 "Her skills in creating and analyzing models of water flow, water quality and sediment erosion that simulate impacts on ecological biosystems is a natural fit to help scientists collaborate in finding novel solutions to address environmental concerns that affect our world," Moorhead said. Linhoss's background includes research projects in the Gulf of Mexico that concentrate on issues such as oyster reef restoration and preventing island erosion by examining the rate of sand erosion at Deer Island and mapping the flow of currents. In Florida's Biscayne Bay, she studies how water quality affects algal blooms and the resulting environmental impacts to the ecosystem. "I am extremely excited to be named the assistant director of NGI and GRI", Linhoss said. One of my passions is working with multidisciplinary teams to tackle complex and integrative research questions. In this position, I look forward to working with faculty across MSU and throughout the Gulf of Mexico to extend our research and promote our work. Before joining MSU's Department of Agricultural and Biological Engineering in 2013 as an assistant professor, Linhoss worked as a postdoctoral associate at the University of Florida, where she earned her Ph.D. She earned a master's degree at the University of Georgia and an undergraduate degree from the University of Colorado, Boulder. In 2017, Linhoss chaired the organizing committee for the SEC academic conference The Future of Water: Regional Collaboration on Shared Climate, Coastlines and Watersheds. Held at Mississippi State, the conference included more than 60 academic, corporate and governmental researchers as speakers and panelists. NGI is a National Oceanic and Atmospheric Administration Cooperative Institute, a partnership of six complementary academic institutions and NOAA which address important national strategic research and education goals. Mississippi State leads this collaboration, partnering with the universities of Southern Mississippi and Alabama-Huntsville; Louisiana State and Florida State universities; Alabama's Dauphin Island Sea Lab; and NOAA scientists at various laboratories and operational centers in the Gulf of Mexico region. For more, visit www.ngi.msstate.edu. GRI provides capabilities in remote sensing computational technologies, visualization techniques, agriculture and natural resource management, and the transition of these into operational agency research, planning, and decision-support programs. GRI has developed nationally recognized research strengths through strategic partnerships with state, regional and national agencies and business entities. For more, visit www.gri.msstate.edu.